This is Beckett. He will be the newest member of our permanent residents living in the Kennel, keeping Juda company. Beckett is a long time boarder here at Bifrost Farms and his dad is very ill. We told him once that if anything ever happens and he needs to make arrangements for Beckett, he would always have a home here. 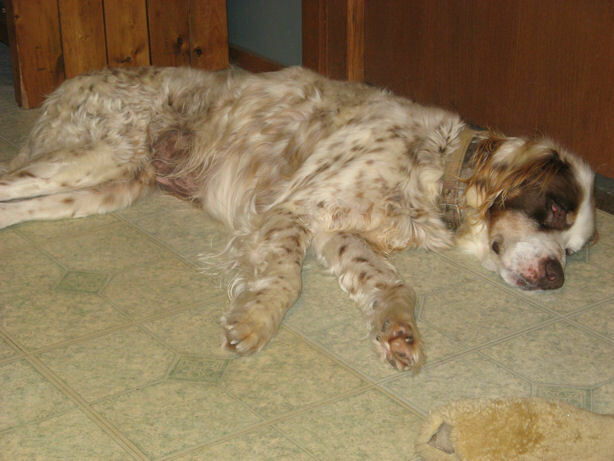 He’s a very sweet, half-blind old hunting dog who just wants a nice warm place to rest his bones these days. Well, unfortunately, that time has come and Beckett will live out his days lazing around on his raised bed in his own private run at the Farm. Rocky Mt. 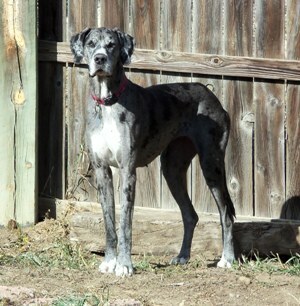 Great Dane Rescue, of which I am on the board of directors, has partnered with adoptashelter.com to make shopping easy for you and profitable for us!! Both me and Molly (to the right) would really appreciate it. Happy and Merry Winter Holiday to you and yours, both two and four-legged.